Confederation of Zimbabwe Industries (CZI) president Mr Sifelani Jabangwe, said companies and individuals who lost their properties to the marauding demonstrators have been plunged into serious financial challenges since insurance firms do not compensate anything destroyed during riots. 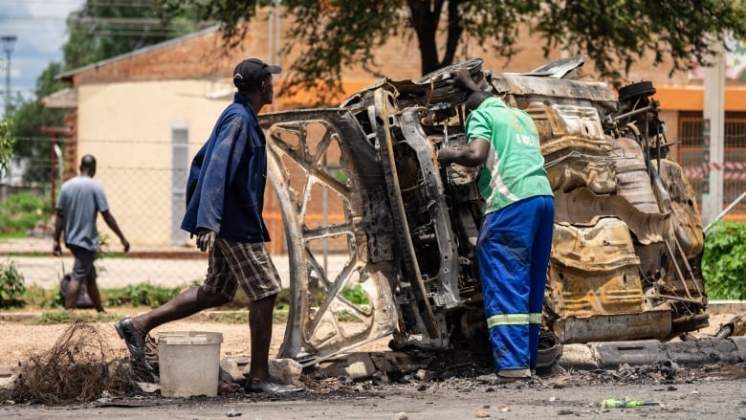 Further, the violence that accompanied the opposition and civic society-instigated demonstrations, might have ripple effects given that they occurred at a time Zimbabwe is badly looking for investors to create more jobs and help turnaround the economy. Capital is generally timid and flies out of seemingly unstable environments such as political skirmishes and wars. "We record about $100 million per day and given that some companies operated on skeletal staff in the last three days, the loss could be between $70 million and $100 million per day." Mr Jabangwe said CZI members lost substantial business as some that had gone to work on Monday, could not deliver the goods to the market because roads were blocked. There are also cases of perishables that went bad as the markets were closed. "The strike has significantly affected our members in terms of production and sales. We are also concerned about the loss of life that we hear, which is unfortunate. These are the economically active that we lost. The tourism sector is understood to have also been hugely impacted on by the violent demonstrations, which some opposition and NGO elements have been planning for a long time with some Western nationals. Hoteliers reported massive cancellations as tourists feared they would be caught in the crossfire. Some countries such as the United States of America, issued travel warnings to their citizens, and consequently resulted in withdrawals by tourists. Impressive tourist numbers are usually central to the good performance of the sector by year end. Going forward, Mr Jabangwe called for "dialogue at the TNF (Tripartite Negotiating Forum) level and drive the economic development agenda". Retail shops and businesses in Harare's Central Business District were closed for three days. National Business Council of Zimbabwe (NBCZ) president Langton Mabhanga said calling for industrial actions and violence to resolve economic challenges was irresponsible. He said building the economy was not a responsibility for Government alone, but all stakeholders which called for responsible actions.